The Bay Bomb - Diwali diva. After being tired of piling up heavily embellished traditional dresses through all these years and not making a good use out of it kinda bugged me. Why waste so much money for something you would rarely use and would give you death stares while peeking through the suitcase above making you feel guilty! So this Diwali I decided to go for something more comfortable, light and versatile. Namaslay everyone!🙏How you doing? Going light this Diwali and yet standing out was kinda difficult. So I went with an indo western outfit that looks apt for Diwali and is reusable, comfortable and light as well. Since a long time I had something in my mind to which gave life, Shilpa! 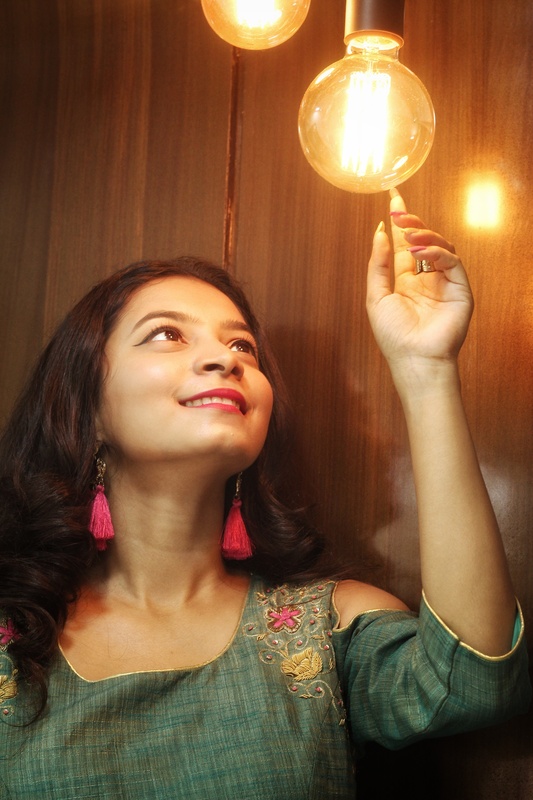 Shilpa is a young designer who believes in wearing what you feel. She has her own store namedDHUNIat moksha plaza, Borivali. I found her collection in vogue and yet unique. After swiping through a rack (or a few🙈) I found is very beautiful dress with an ethnic touch. The box pleat design with cold shoulder and jardoshi embroidery looks chic yet elegant. After a discussion she decided to customize it for me with a dhoti. The colours are modern and belongs to the lighter and pastel colour pallet. It's a beautiful set that can you use separately as well. 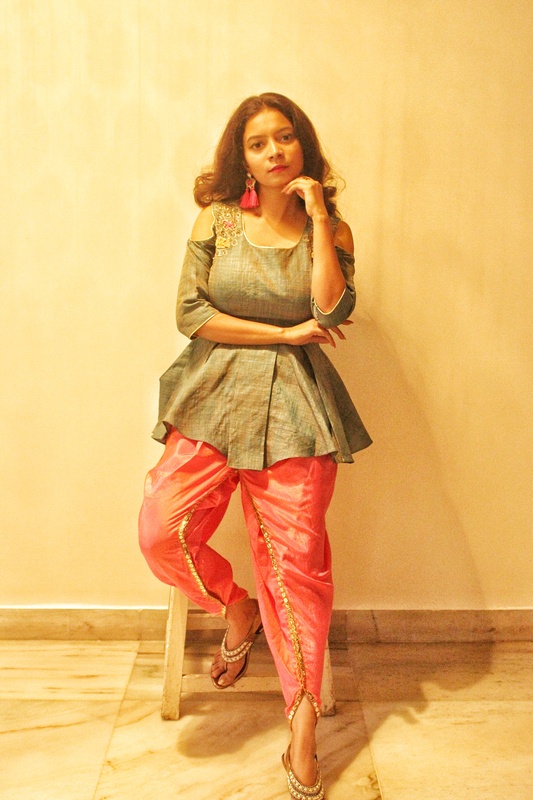 Pink dhoti which can be teamed up with a kurta or a crop top. The top can we worn over pencil pants, palazzo and the list depends on how creative you can get. 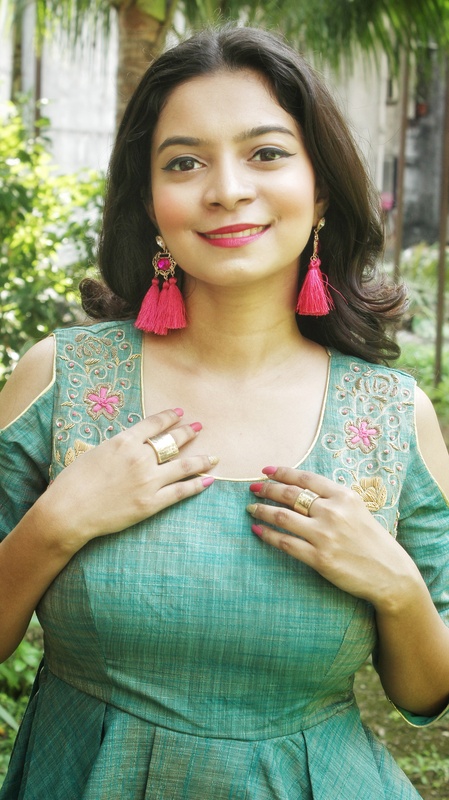 Styled with a pair of copperish golden pearl embellished sandals with minimum heels, a pair of bright pink tassel earrings for that pop of colour, topped it off with a 2 geometrical rings one in each hand. That's how I'd dress up not forgetting my culture yet being a millennial. Pictures by Dhaval and Yashvi. Wish you all a very happy Diwali. Be the light that makes the world brighter. Be safe and avoid crackers . Twist the look your way and tag me. Let's spread girl love and inspire each other. Let's come together and make a dope fam"The Bomb Fam" If you are on my space for the first time, Hey there! Scroll down to know more. Also don't forget to click on the follow button on down right of your screen to get the notification everytime I post. Follow me on my social media profiles to get a sneak peek of my life, Instagram/Snapchat/Roposo : the_baybomb. Stay tuned for my next one, till then stay bomb and keep slaying. More hope, love and positivity to you, The Bay Bomb, Sonia Patel.